Some days I laugh when I see how hard this generation of parents must work to teach their kids about real food. But we need to. When I recently interviewed a group of octogenarians, they all mentioned that “from-scratch” cooking while they were young was just called, uh, cooking. There were no boxes or bags. Since their era, childhood obesity has climbed and right along with it are other health complications like type 2 diabetes, elevated blood pressure, obstructive sleep apnea, cholesterol disorder, and even psychological problems. It’s not all grim, though! According to the American Heart Association, involving children in preparing food is a contributing factor in sticking to a healthy diet. Although it takes a bit more time and a few extra dishes, I decided to allow my toddlers into the kitchen. I want their food paradigm to be closer to that of their great-grandparents. But just how do you involve these little monsters? I remember the first time I let Big P, age 4, crack an egg. I let him do it over the mixing bowl, and there were little shards of shells and a boy with slimy hands. I was irritated and he knew it. Another time he freely dumped in salt without my knowledge. Again, I was irritated. I finally decided that an annoyed mother wasn’t going to give him that delightful happiness-in-the-kitchen feeling. So I developed a few strategies to set him up for success. Like for the egg, I brought a little ceramic bowl down to his level. Then I could pick out any shells before letting him slide the eggs into the main mixing bowl. Phew. Now Big P is confident in this task and rarely leaves any lingering shells. Now I also include Middle E, age 2 1/2, with similarly easy tasks. He is great at dumping in pre-measured ingredients, punching down dough, and grating fresh nutmeg onto his oatmeal. But I wasn’t about to let them use knives. No way. That was until I read the book Pretend Soup by Mollie Katzen and Ann Henderson. This cookbook is geared toward helping parents work alongside their preschoolers in the kitchen. And they use knives. I now allow my boys to use steak knives, peelers, and kitchen shears. It took some getting used to, and there were even a few cuts. But after some safety tutorials and modeling, they can successfully cut a cucumber or tomato. 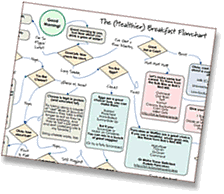 Check out the book for their safety rules if you are still skeptical. Tip 1: Set them up for success and safety. Give them their own work space and kitchen tools. Make sure they work on a stable surface. Review knife rules. Tip 2: Don’t assign them a task that could ruin the meal. Kitchen confidence grows as kids do tasks successfully – so give them simple jobs like whisking, stirring, measuring, or counting. 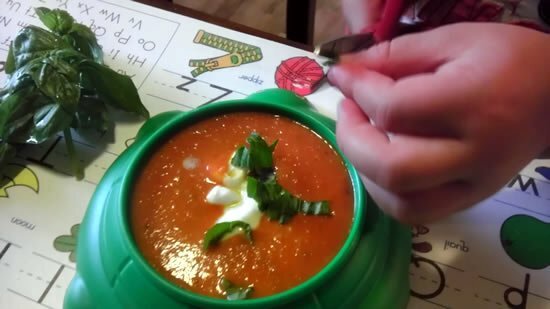 Measure ingredients into bowls and let kids dump them in. As they grow, they can do the measuring on their own. Tip 3: Plan toddler help on the weekend or a night without other commitments. Start including your kids in the kitchen when you have more time. You will be less stressed because there is no rush to get to soccer practice or a guitar lesson. Tip 4: Give them clear instructions & give praise for following them. Supervision is a big deal for little people. They need a happy, patient big person near them talking them through the recipe. Plus, you’ll genuinely love the time together playing in dusty flour. I decided for October Unprocessed we had to make tomato soup. I grew up on the canned stuff. A lot of the canned stuff. The timing was just perfect because we just hauled in our very last garden tomatoes. In honor of the great-grandparents I used a recipe from 1945 as my starting point. This recipe included a few awesome toddler-appropriate jobs. My boys peeled off the tomato skins, poured water, stirred, and snipped. Big P garnished the soups with fresh basil that he picked from our garden. But don’t panic – he didn’t run to the garden while carrying the scissors. This recipe included a few awesome toddler-appropriate jobs. My boys peeled off the tomato skins, poured water, stirred, and snipped. Big P garnished the soups with fresh basil that he picked from our garden. But don’t panic – he didn’t run to the garden while carrying the scissors. In your favorite soup pot, cook butter, carrots, celery, onions, and garlic over medium high heat. After about 5 minutes, add flour and spices. Cook for another 3 minutes, stirring constantly. 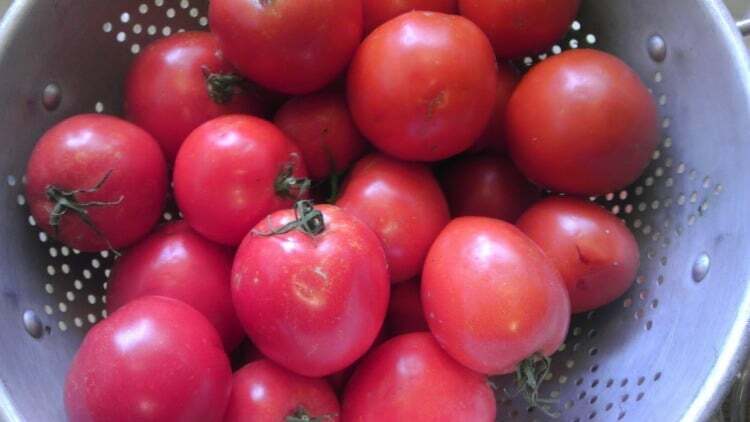 Add water and tomatoes and reduce the temperature to low. Let the soup cook for about one hour, stirring occasionally. Once the soup has thickened and reduced in volume a bit, it is ready to be blended. Remove the whole spices using a slotted spoon. Carefully puree the soup: Use an immersion blender, or allow to cool enough to transfer safely to a blender or food processor. Garnish with a dollop of plain yogurt and fresh basil. Enjoy with your favorite people. Note on peeling fresh tomatoes: Place tomatoes in boiling water for 2 minutes, then move them to a bowl or sink full of cold water. The skins will peel off very easily. This is a really entertaining job for kids. I totally agree – there is something so comforting about grilled cheese with tomato soup. I hope you love the recipe! Great advice, Allison. My niece (now almost 5) loves helping in the kitchen, so when we’re all home for holidays, I always cook with her. When she was 3 we made crab cake eggs Benedict because hey, why not? We don’t have kids yet, but I always helped my parents cook growing up and I can’t imagine not teaching our kids the same way. Aunt Stacy Rocks! 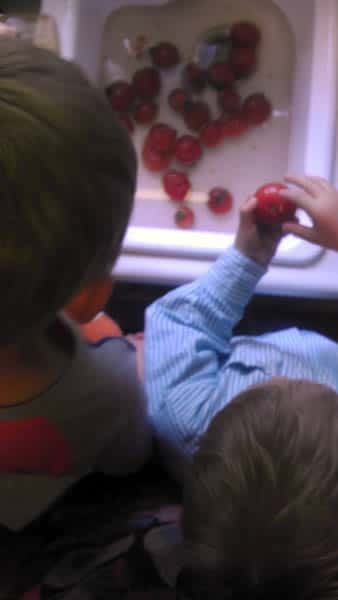 You don’t have to be a parent to help kids learn about real food. Bravo! Great tips! I agree–cheerleading is a big part of kids’ kitchen success. Such a fun recipe to make together! 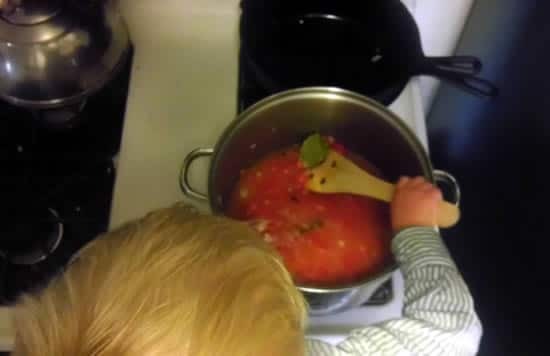 my DS is 5 months, and I am so excited to get him interested in and excited about cooking! I loved helping my mom in the kitchen when I was little. A sweet 5 month old can definitely enjoy being in the kitchen with you. He can be your sidekick and wield a wooden spoon! Alan Greene, author of Feeding Baby Green, wrote about letting babies watch real food being handled, like watching mom peel a banana when he’s ready for solids. Enjoy your little chef! I always wore a wrap with my son in it when he was an infant. Now he’s 18 months and I have him help pour items into the bowl. I love teaching him and he loves helping me in the kitchen. So many children are disconnected where their food comes from. It helps to connect them to the source when they make it from scratch – expecially meat products.